You all missed a great show. No, seriously, you did. Sure it was a Wednesday night and according to the event postings and live house ticket sales they were set for the late stage time of 11:15pm. But you should have been there. Upon arrival and checking in with the swag booth we were informed that the set time was actually 10pm! Though I quickly sent a tweet to the effect, I am sure that this did influence a portion of what would have been concert attendees had they realized the set time was a bit more reasonable for a Wednesday work night. That said, for their first and only Canadian tour date it was a poor showing from the fans. MAN WITH A MISSION took to the stage shortly after the change-over from their opening band, PARTYCAT, fantastic local band from T.O. Not one to hold back, nor daunted by the small crowd, MWAM lit the stage up with their energy and never looked back. Opening with distance, then straight into evils fall, we were jumping, headbanging and moshing as the night just began. Jean-Ken Johnny’s voice reaching out over his guitar calling you in, only to step back and let Tokyo Tanaka take you away. After a brief MC you were right back into it. I was happily surprised to have a cover of Nirvana’s Smells Like Teen Spirit thrown in the mix, serving to only ramp the crowd up even more. Just when you thought the energy couldn’t get much higher, Kamikaza Boy became electric, his eyes lighting up, eliciting howls from the fans. The efforts to crowd surf increased, though daunted by lack of base support. But that didn’t stop the most dedicated fans from reaching their desired heights. As we reached the climax of the concert, WHEN MY DEVIL RISES, topped off with Emotions came all too soon. The crowd wasn’t done and neither was the band. Spear Ribs was first out on stage, leading the charge and driving the energy back up. We were treated to a double encore which had us as wired as the concert start. Neither the band, nor the crowd’s energy waning. As the final song, MASH UP THE DJ!! came to a close, the band said their thank-yous to the crowd. DJ Santa Monica, whom I didn’t have the best view of from my side of the stage, came up front and I was lucky enough to snag the white disc cover as his arms stretched out to the fans. Honestly, I had so much fun. Though the crowd was small in size, it was one of the most fun groups of people I’ve enjoyed a concert with. They gave every ounce of energy to support MWAM. 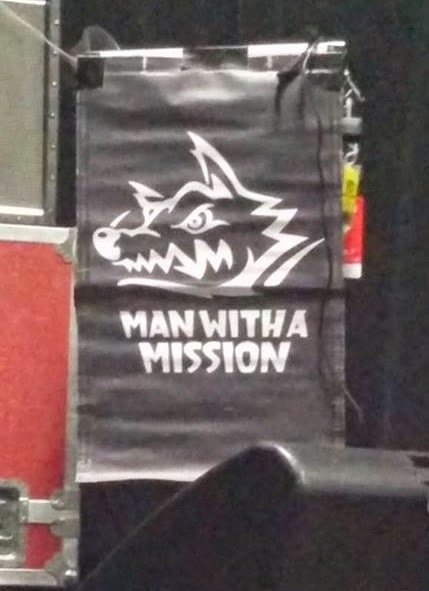 This of course not possible without a great band performing, and MAN WITH A MISSION is a great band. I know I’m not the only one hoping for their soon return. Catch them on their US Tour!